I had a bit of a brainfart today and was having trouble picking a design to do. Rafik, being the confident, supporting man he is, says, “What’s the big deal? Its not hard! I could do it!” Anyone who knows our dynamic knows what came next- “Oh yeah? Prove it! 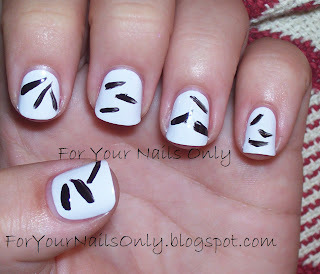 !” Needless to say, he recanted his former “Its not hard” statement and has given due respect to all those nail artists out there who make it look so easy. I liked his design and so I expanded on it, putting on my own twist. PS- You know I love you, Rafik! For this manicure, Rafik used one coat of OPI’s Natural Nail Base Coat, and two coats of Sally Hansen’s Lavender Cloud as a base. He then used Sinful Colors Black on Black for the design and two coats of Seche Vite to finish it off. Isn’t he fabulous? 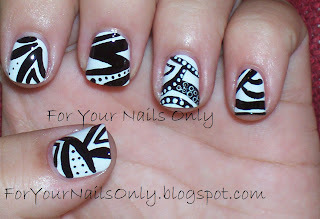 This entry was posted in Nail Art and tagged black, creme, OPI, Sally Hansen, Seche Vite, Sinful Colors, white by Tara. Bookmark the permalink. A collaborative effort–I love it! Tara, I couldn't/wouldn't allow my husband anywhere near my nails. :) I can get him to rub my feet, though. I think Rafik (what a cool name!) did a cool abstract design. He will have to be a guest designer/artist again. Haha I think his attempt is noteworthy, but your design is a lot more intricate! It's very nice in an abstract call of the wild look. Rafik is SUPER COOL and multitalented!! Wish there were more men out there like him but he is ONE OF A KIND!!! DARN!!! I agree with Rafik, his design is sooooo much better and just FIERCE. I have no words…. Anonymous/Rafik I love you. That made me have a good laugh!